Eternal Hybrid Water Heater is the most efficient design with 98% AFUE. 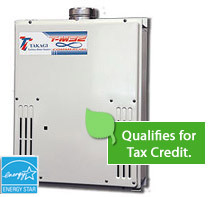 Their State of the Art design integrates the best feature of tank and tankless water heaters. The 2 gallon reserve tank eliminates cold water sandwich and long delays for hot water. It has the best warranty, 20 years on its stainless steel heat exchanger. With endless hot water this award winning unit has features to meet everyone's needs. 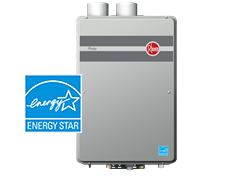 The Rheem Prestige RTG-95DWN provides continuous hot water at .26 GPM minimum flow rate! These units eliminate the expense to continue heating and reheating water when you are not home or not using it. The space saver design allows you to reclaim valuable space now being taken up by the convention storage type heater. 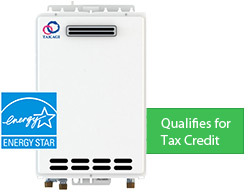 They come with a limited warranty of 12-years on the heat exchanger and 5-years on the parts along with 1-year labor. 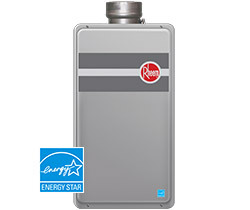 Rheem Prestige Condensing Tankless Gas Water Heater provides continuous hot water at an energy factor of 94%. These units eliminate the expense to continue heating and reheating water when you are not home or not using it. The space saver design allows you to reclaim valuable space now being taken up by the convention storage type heater. Rheem has over 120 years experience building water heaters. This one comes with a 12 year warranty on the heat exchanger and 5 years on all other parts. When installed by Harry Clark you can be assured of years of trouble free operation. The all new T-K4 models have an impresive max GPM of 8.0GPM! The T-K4-OS has a built-in power venting system and was designed specifically for outdoor installations. The T-K4-OS does not require any additional Category III venting or vent caps, making installation one step easier for installers. The T-K4-IN can be installed indoor with option DV kit available. The T-M32 is the big brother to the T-K3 and is designed for commercial and heavy duty applications. 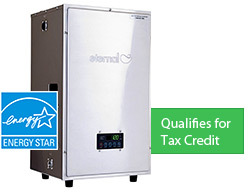 With its Energy Factor 0.82 it meets the standard for the federal tax credit for energy efficiency. It can be installed indoors or outdoors, used for domestic hot water and heating systems. This unit can provide from 0.5 to 9.0 gallons of water per minute and has multiple temperature set points. This unit is 18.5" wide by 23" tall.